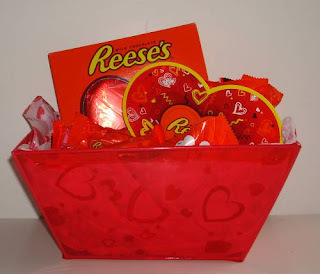 Our Reese's Valentine gift basket is perfect for the Reese's lover. It is filled with all Reese's candies. Peanut Butter, chocolate and hearts what a way to say I LOVE YOU ! You get a 5 oz boxed heart, 2 full size hearts, 3 snack size hearts, a heart shaped box with mini peanut butter cups and 8 miniature peanut butter cups and foil wrapped Reese's peanut butter hearts. All of which are milk chocolate. This is one of those gift baskets that is loved by all. Whether you are looking to buy a gift basket for a teen or adult you won't go wrong with the Reese's Gift Basket. You can buy this gift basket and have it delivered right to your Valentine's house and send it directly to you. Order early as this is one of our most popular Valentine Baskets and sells out rather quickly. Chocolate stars by Brach's candy company are one of the most delicious stars on the market. These unlike many others are 100% milk chocolate. To some this is not an important factor and to others, well these are the only stars they will purchase. Chocolate stars are available all year long , but they are somewhat hard to find except at Christmas time. The reason for that is not what you make think. Many of our customers think it is because they are shaped like stars for Christmas. The real reason is that they are perfect for your Christmas baking. I am sure you have made Christmas cookies and placed the stars in the middle. These cookies seem to be one of the most popular ones , besides sugar cookies at Christmas time. I have to wonder why we don't make these cookies all year long. If you have made these cookies using Brach's chocolate stars you may have noticed that they don't melt and turn into a messy drippy chocolate puddle. The reason for that is because they are 100% chocolate. Many will melt the stars instead of slabs of chocolate for making fudge, fairy food or dipping pretzels and other treats. While all these are tasty I prefer to just eat them right out of the bag when I am having a chocolate craving. 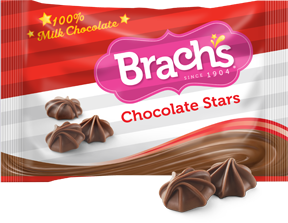 So the next time you are thinking of buy chocolate stars for your making needs or your chocolate craving make sure to buy Brach's you won't be disappointed. 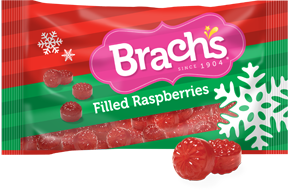 Brach's filled raspberries are the perfect old time Christmas candy. Hard candies in the shape of raspberries with a chewy center. Filled raspberries are one of those candies that have been around for many years. 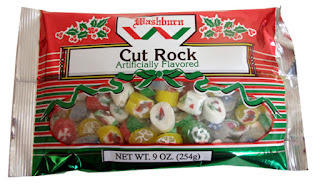 It is one of the most popular Christmas candies. Many will remember these as being seen at your Grandparents house during the holiday season. Sadly these are only available at Christmas time. We have many customers who will buy many bags of these sweet treats so they can eat them after Christmas has come and gone. Filled Raspberries are just one of many old time Christmas candies we carry. We believe that many customers buy these candies not only because they are tasty but also because they bring back many fond memories of days gone by. If you like raspberry candies and never tried these we recommend you buy a bag or two. Your taste buds will thank you. Labels: Brach's Christmas Candy, Filled Raspberries, Old Time Christmas Candy.